Updated for patch 1.1, also included some additional tips on the Jindo, HK-47 and Malgus fight. Hello everyone, here is another flashpoint guide, this time introducing the False Emperor, one of the three normal mode flashpoints available at level 50. This flashpoint is also avilable as a hardmode and I will provide commentary on the hardmode version of the fight as well. Also for hardmode, almost all of the bosses have enrage timer, which means that if you have low DPS, you may not make it past the encounter as when the bosses enrage, they hit extremely hard and will one or two shot the tank. Knockback: Make sure you position yourself so that you won’t get knocked off the bridge…He does it a lot to tanks. See where our tank position him against the wall. Tank need to remember to run out from his whirlwind slash ability and move back. Hunter’s Leap: Tregg will leap to a random party member, which isn’t a big deal but it is the ability that follows that hurts..
Whirlwind Slash: Tregg loves to do a combo where he leaps to someone and use this ability next. It is pretty obvious when he uses it. You need to move it away from him or get damaged for 2.7 k damage per tick. Pretty easy fight otherwise, just make sure people know to back away from the boss when he does the whirlwind attack and tanks don’t get knocked off the ledge. Hardmode: Same abilities. Whirlwind Slash is very unforgiving and will take you out very quick if you don’t move out right away. If he leaps to you, run away. Sometimes he will follow with a whirlwind slash and sometimes not but better be safe than sorry. This applies to tanks too. The following video is of a hardmode version of the fight. Same mechanics, just more unforgiving. The boss itself is pretty easy but it’s the spaceship that adds additional mechanics. There are three turrets located in the room which you need to utilize to deal with the spaceship. The spaceship is located to the left of the turrets. It can move forward/backward and sideways. If it moves forward, it can fire a whole bunch of rockets on the ground, making the fight a lot harder. However, if you have someone on the middle turret (where the spaceship appears initially) and just click the turret whenever the spaceship gets close, it will push the spaceship back (It will emote – Ship targeting system disrupted! Target lock reset!) This cause the ship to use exclusively long ranged missile, which you can avoid as there is a red circle on the ground letting you know where the missile will land. If you do not click on the middle turret right away, the spaceship will move away and increase missile damage by 100% periodically (i.e. 200%, 300% etc..). You might be able to recover if the spaceship moves away from the middle turret but the turrets have a chance to bug out and not affecting the ship even if you shot at it if this happens. 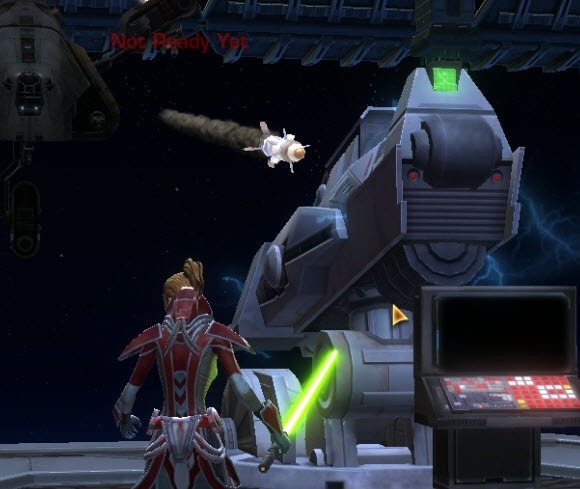 It is recommended that you have two people running to the middle turret and using the console right away at the start of the fight. Jindo will likely grapple one of the person away from the console, allowing the other person to work on the console unhindered. 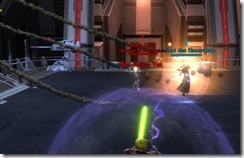 Stun: this ability is either called charging electro dart barrage or electro dart. The stun doesn’t last for long (~3 seconds). Flame Sweep: This is 360 degree AoE that can be and should be interrupted. Grapple: he likes to use grapple to pull the tank back if he/she gets too far away. Overall, the boss doesn’t hit too hard; if someone is on top of the turrets and deals with the spaceship then it can be a very trivial fight. Hardmode: Exact same mechanics as normal mode except you need to be on top of the turret to shoot the spaceship back. Eventually the spaceship will be destroyed and only the boss is fight. Pretty easy fight even on hardmode. 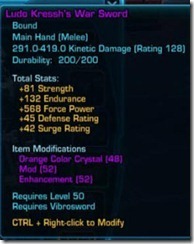 Drops: He drops the Tionese gloves. 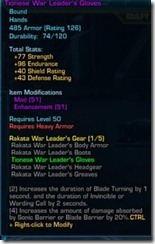 Here is the screenshot of the tank heavy armor version. This is a pair of droids you will encounter. One of the droids will go into a defensive mode called Simulation Mode where it stops taking all damage and throws a saber attack at random party members that hits for ~ 1.4 k HP. 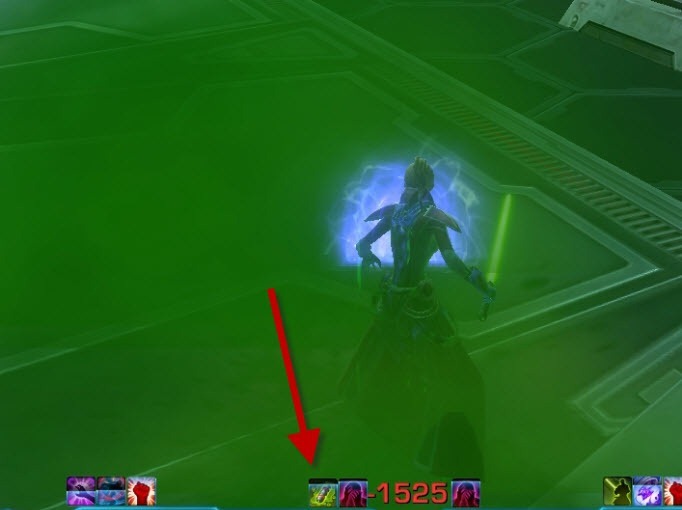 You will know which droid has this mode active because it has a blue aura around it. 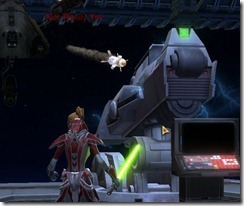 Attack the droid that is not shielded and healer watch out for the throwing saber attack that the “shielded” droid does. Pretty much a “tank and spank” fight otherwise! 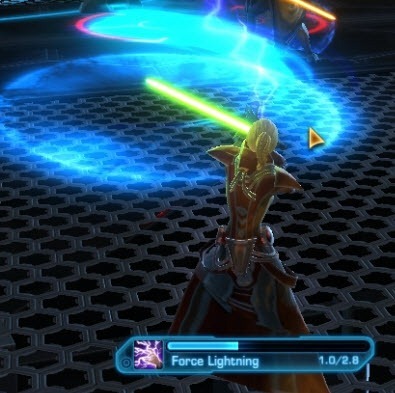 Hardmode: Pretty easy as well except the saber throw does a lot more damage and the shield from sith sorc/jedi consular definitely help absorb some of the damage. Tough fight to heal throw but mechanic wise very wise. Surprised! 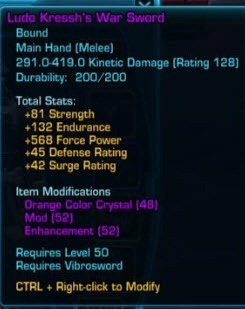 HK-47 is back new abilities! 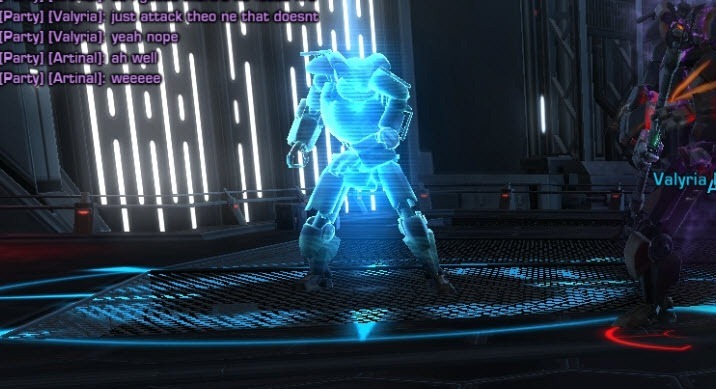 None of HK-47’s abilities are interruptible as he has the unshakeable buff. This fight also have very high “bursty” damage so tanks could go from full health to dead in the span of a few seconds. Burst: This one hurt and seems to be conal so tank need to face him away from the group. It hits for 3.3 k per tick so it hurts! Grapple: HK-47 loves to grapple (pull) random person in the group to him and then use Burst on them. Healers need to be on the ball when this happens. Snipe: This one hurt but least you get a warning when he uses this ability (Advisory: Prepare to die). Sage/sorc healers can use their shield to help mitigate some of the damage. Past 50%, HK-47 throw new tricks to the box! Stealth: HK-47 goes invisible for a couple seconds and then pop up beside someone to stun them and land a DoT (Poison Grenade) on them and goes invisible again before reappearing. Poison Grenade: Applied to the person HK-47 appeared next to. It is a DoT that ticks for 1.5 k HP per tick. Healers can probably cleanse it or heal through it on normal mode. Anyways, it is a very long fight and the tank takes a lot of damage so this is by no means a trivial fight. Hardmode: In addition to all the mechanics above, two turrets also pop up that are shielded and cannot be damaged except by Ion cannons. However, these turrets do very minimal damage and can be ignored. What is really difficult about this fight is the Poison Grenade dot. This dot literally ticks for 2 ticks before it kills someone. One trick around this is to do AoE attacks while HK-47 goes invisible (everyone should group up and drop AOEs around yourselves, this way you are certain that HK-47 will be damaged by the AOE). This will break HK-47 from invis and prevent him from applying this poison dot to party members. You can try to cleanse it off people but it is very hard to time it. 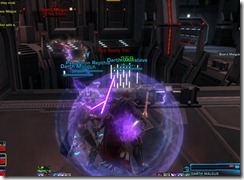 Drops: HK-47 drops a main hand weapon. Here is the tank version. In the hardmode video below, we did not use the AOE trick. I was able to cleanse it off one time but not the subsequent DoTs. We managed to pull it through by DPSing him down (challenging fight if done this way). He is a mini-boss. Pretty much a tank and spank fight. His only ability worth mentioning is Spinning Strikes, an AOE ability that seems to be able to be interrupted. He is a bonus boss before the last boss. His main thing is that throughput the fight, he will disappear and 3 copies of him will drop off from the sky and attack. He did this about 3 times during the entire fight for us. These 3 copies do not hit hard and can be tanked by a DPS easily on normal mode. We had the tank engaged in one and the two DPS each take one to kill. Force lightning: standard channeled ranged attack. He is interruptible so all the lightning abilities can be interrupted. Hardmode: The hardmode adds do not hit hard either and can be tanked by DPS or the tank can grab all 3. The enrage timer is very tight on this fight and can be difficult for undergeared groups. Skipping him is an option. He is the final boss of the flashpoint. The actual fight is not very hard but it is finishing off the fight that takes coordination. (As of patch 1.1 you can get pulse grenades outside his room that will grant you the knockback ability if you do not have it already). Push back: His push is huge! You have to be careful where you position your back or you will get knockoff the ledge nearby. He does this mostly to tanks but DPS/healers should also watch out! We fought him on the stairs, facing our back to the wall and dragged him to the ledge when he is ~ 15% to finish off the fight. Force leap: He will force leap to players far away that have aggro. Smash: If you are close to Malgus, he will occasionally jump in the air and land, hitting nearby players for about 1.8 k HP. Range on this is about 10 meters. Doubt: He will select one person in the group and cast Doubt on them (he emotes the following shortly before this happens – Malgus is filling Player’s mind with visions of doubt!). 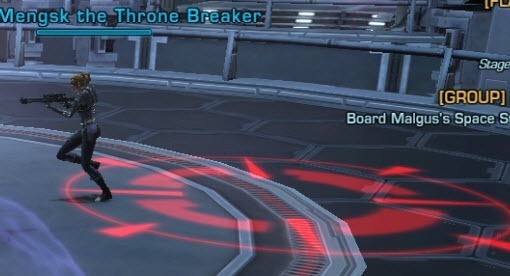 Then about 10 seconds later, that person is stunned a good 8 seconds and cannot break free using CC breakers. The start of the 8 second stun is indicated by – The doubt weights heavy on Player, they must face their destiny! 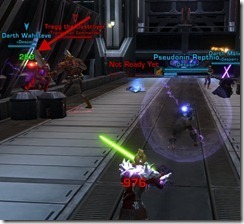 Right after Doubt expires and you exit out the stun, the rest of your party members are force choked for a good 15 seconds and you are left to face Malgus alone. This is indicated by the following emote – The time has come! Player must face Malgus alone! Malgus hits for about 1.8 k per hit on normal mode. 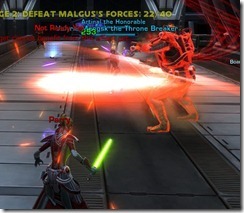 Healers can heal through it if they are left to face Malgus alone. DPS should kite him in a circle and tanks can simply stand there and take a hit (but save your defensive cooldowns if need). 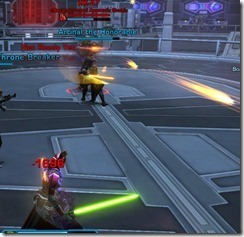 The rest of the party do not take damage while they are being force choked. Malgus has no significant AoE abilities during this period. At around 10%, Malgus stops taking damage and chain casts Force lighting. You cannot interrupt this and cannot line of sight (LOS) it. 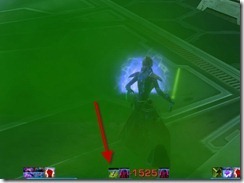 You should start kiting Malgus to the ledge at around 15%. He will direct this at random party members and each tick hits for 1.8 k HP. This is essentially a soft enrage and you need to push Malgus off the ledge or you will run out of time eventually as your healers cannot keep up with the heavy group damage. The way you push Malgus off is simple. 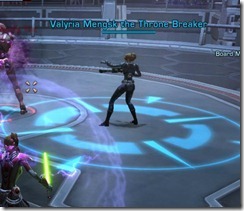 You need two knockbacks that are timed perfectly behind each other while Malgus is channeling Force Lighting and only when he is channeling that spell. This is because when he is channeling force lighting, he is susceptible to knockbacks and when he is not channeling it, he is immune to them. You must coordinate these knockbacks so they are consecutive and they land while Malgus is channeling. You could also try with a knockback and force push combo as well. 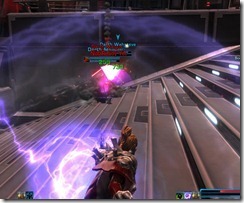 Powertech tanks can run off the ledge and grab Malgus with them while he is channeling. Hardmode: At around 50% and 20%, Malgus will cast something called Unlimited Power, it has a 2-3 second cast time and must be interrupted. Failure to do so will cause Malgus to unleash a huge AOE that will wipe out your group, leaving possibly only the tank alive. There is a buff on Malgus shortly before Malgus casts Unlimited Power. It has the same graphic icon as Unlimited Power and serves as an early warning. 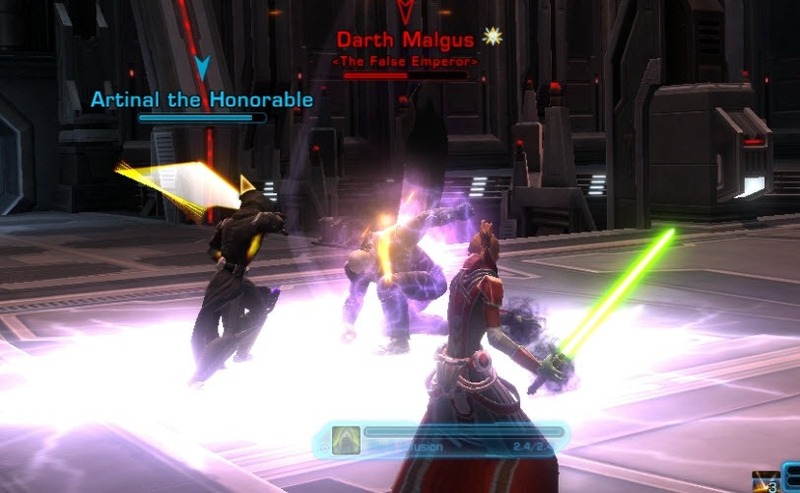 Also, Malgus have a hard enrage timer so if you do not push him off quick enough he will wipe out the group. Here is a video of the Hardmode fight, first video is a very short clip showing you how to push off Malgus. The 2nd clip shows the entire fight. Just pugged through a heroic last emperor and 1 shot our way through everything despite never running the instance beforehand. From one healer to another, tyvm for this guide! Do you have any tip when use cure to clean this killing debuff after stealth phase? And about icon… sometimes its like on your screen – something green – and with this its no problem to cure it. But sometimes its like on your movie – blue one – its really hard to cure. 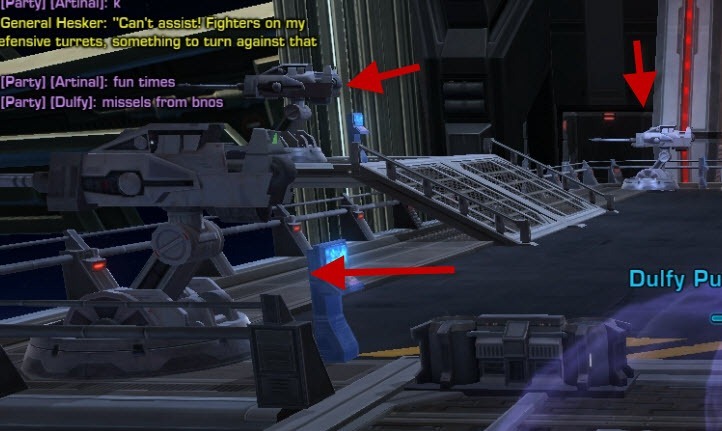 Hey, if you use AoE attacks when HK-47 goes stealth or have a trooper/bounty hunter use their anti-invis probes you don’t need to cure/cleanse it at all as HK-47 won’t be able to drop the dot. Just make sure everyone stack together and drop AoE right on top of you party so that HK-47 will take AoE damage when he comes near and breaks out of stealth. We only cleansed the first time killing HK-47 and it was really a trial/error process. After we learned this trick we never had to cleanse again. You can really trivialize the amount of healing required on the boss fight with the two Prototype Droids by pulling them far apart from each other. This may be a useful for strategy to consider for hard mode, particularly in groups with lesser geared players. The tank should run in and build up threat until one of the droids enters Simulation Mode. At this point, he should run back the way the party came from towards the elevator with the active droid in tow (and the rest of the party should follow!). You don’t have to go all the way back; about half of the way should suffice. 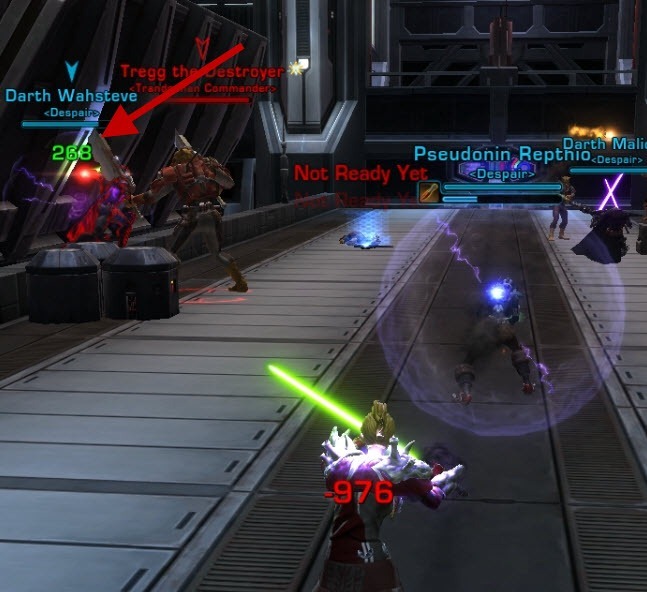 The droid in simulation mode will no longer attack party members when you’re at this distance, meaning your healer can rest easy. You will need to run back and forth between the two droids as they enter and exit Simulation Mode, but as far as I can tell there is no enrage timer (did this with 2 players and 2 companion healers, so the DPS was really low!). Actually I wanted to write a bit on that as well. The above strategy is counterproductive because of one thing. The “thrower” has a blue circle around him. That is a dead zone, so to say, where he CAN NOT hit a target with his knife throw. So if you keep everyone close and in that zone it makes fighting very very easy as only active droid attacks tank and he does not hurt you at all. Interesting, I did not know about this dead zone, thanks! 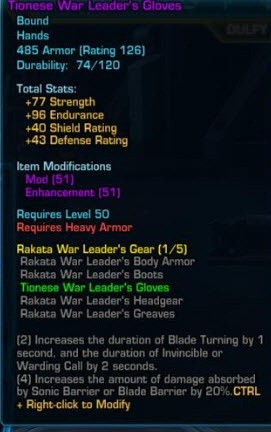 Should help when my republic char get to 50 hehe as this fight is hard to heal otherwise. We just did it this way and it was a piece of cake. Thanks! Another strategy for this is to tank the bosses near the doorway to elevator, and when one becomes shielded, hop around the doorway and line of sight it. Then when the one you are fighting becomes shielded, hop around and start attacking the other one while line of sighting the shielded one. It becomes a very trivial fight. You are welcome 🙂 Actually when utilising all above tactics …. FE becomes THE easiest HM FP so far (did Taral V, Battle for Illum and D7 (this was a wipefest on Bulwark)). One thing that is worth mentioning abt Malgus fight is that he will use his Unlimited Power skill after one of the “prepare to solo fight Malgus” parts. So if a players has been kiting him a lot (and far away) during that part he/she should pay attention to the boss! We had a wipe one time when our gunslinger kited Malgus around the throne … and when she returned to us we saw no Malgus following her and were “O_o where is he?” and then in a couple of seconds it was BAM! Group wipe. That was the first and only time we have seen UP unleashed 🙂 Not pleasant, hehe. He does…I’ve been in solo with him and he has tried to unleash it, thank god for jolt. I find that he loves to solo one person right at 50% now. 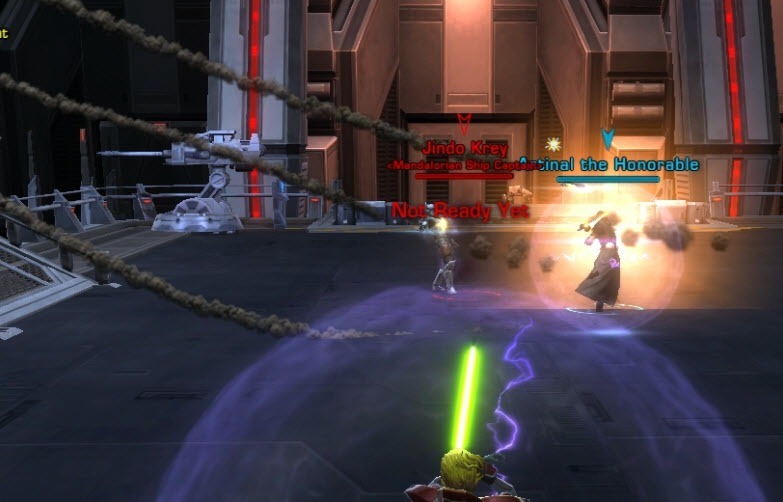 There is a lot that you can do to make the Sith Entity bonus boss fight easier, and mostly it has to do with managing timing. 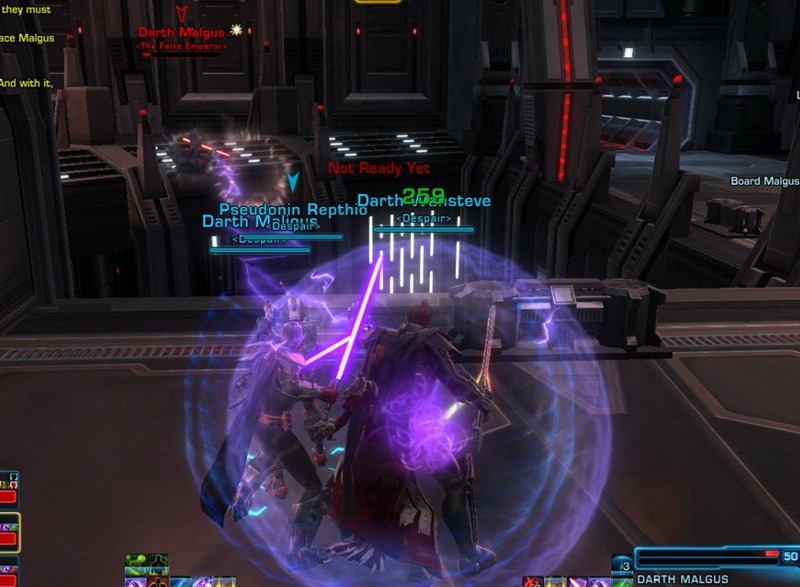 The Sith Entity doesn’t have an enrage timer so much as he has an enrage phase. After a fixed amount of time as the boss-class Entity, he will split into three strong-class adds (without Boss Immunity, so they can be stunned and knockbacked/harpooned) three times. After the third split, he’ll be enraged and start killing people. It doesn’t matter at all how much time you spend fighting the adds, you always spend the same amount of time fighting the merged boss and he’s always enraged as soon as you finish off the third set of adds. The adds also always spawn in the same place every time, on the square where the Entity was initially floating. The melee add spawns in front of the circle, and uses Whirling Blow/Lacerate, a melee range AOE. The ranged add spawns on the rear left corner of the circle, and spams Force Lightning and will not move unless moved with an ability (Harpoon, knockback, etc.) Healer add spawns on the back rear corner, spams Benevolence and a weak instant lightning attack that I barely noticed when healing, and will also not move unless moved. Since the boss’s enrage timer is effectively on hold while fighting these adds, the strategy is simply to minimize damage in this phase and leisurely work down the adds, letting buffs rebuild, cooldowns recharge, and resources refill. The tank should pick up the melee add and tank it on top of the ranged add, and focus on interrupting the ranged add’s Force Lightning. The DPS burn down the healing add, then switch to one of the other adds (melee if you have any melee DPS, ranged otherwise), then just work down the remaining add with their free attacks. 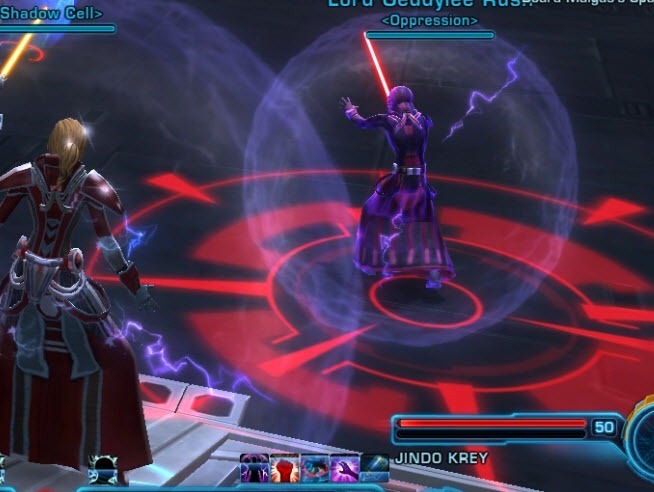 Once the adds are down and the boss Sith Entity reappears, let the tank get aggro, then pop your cooldowns and burn the boss as hard as possible before the next add phase. If the boss does reach enrage (and it probably will if you still need gear from FE), the tank should kite and buy time. If you have any melee DPSers, though, they need to wait and used ranged attacks only until after the first Overload knockback attack, because it will likely one-shot them and it’s the first special ability he uses after enraging. 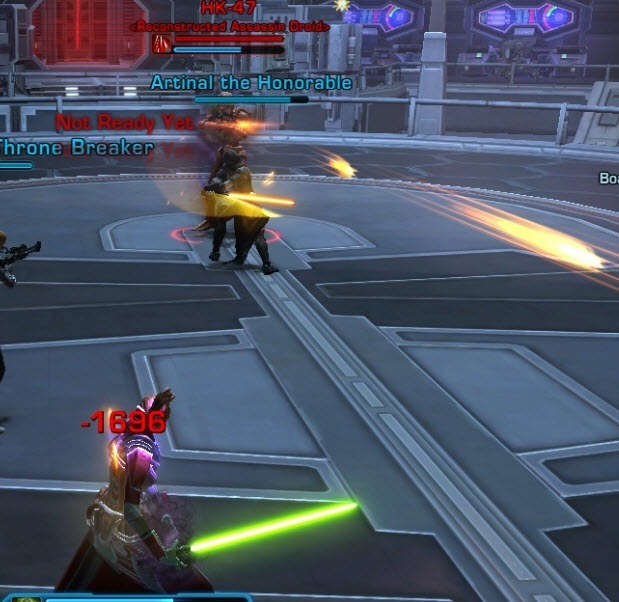 That’s how you do the Sith Entity fight. Slow-roll the adds, hard burn on the boss, kite when he enrages. I’ve dragged DPSers in half greens through this fight using this strategy. Also, for Malgus, if you have a well-geared DPSer (all Tio-equivalent with some Colu pieces, at least) who is relatively resistant to pushback, it’s possible to kill Malgus without the need for knockback. Your well-geared DPSers should save their offensive cooldowns. If they are picked for the last Doubt phase (generally after the second Unlimited Power), pop everything and burn like crazy. It’s possible to just kill Malgus stone dead before he goes into his damage-immune-knockback-vulnerable phase. This is kind of a gimmick, but it’s worth trying for bragging rights. 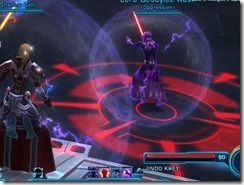 ahh good info on sith entity, thanks for sharing! Although I am not sure if he always enrages after you kill the 3rd set of adds – we had killed this bonus boss before without him enraging but I havn’t done HM FE in a while! Well, we now have a new tactic. Average gear’d group, almost full purple, On Hard mode Fighting Malgus today our sorc DPS got knocked off just after the text said Malgus was testing his resolve. Well, no one was choked, so we sat and burnt him down, 10K health, our sorc comes back in, chucks a few lightning bolts, Malgus dies, at our feet, on the bridge. With the new flashpoint nerfs on 1.3, a jugg can now push Malgus off solo. Angel is important though as you can accidentally push him to one of the connecting ledges. The two overload method still works as do the grenades. On the HK fight if everyone is low health you can LOS the turrets(turrets do not pop in reg mode) by going back through the door you entered and AOE heal, then re-emerge and burn the turrets. Different mechanic on A-14/B-16 now. Need to stay in the blue circle around the second droid or prepare to be one hit killed. We were seeing up to 185k damage. Wasn’t pretty. Didn’t find the blue circle comment until later. Also, typo mentioned earlier isn’t fixed. Last comment, Jindo battle is also currently bugging. Sometimes the cannon isn’t resetting the target lock and the ship pulls all the way onto the platform. Also missle strike locations no longer showing targeting information on the field of battle. So that’s why I can’t get past it solo! How I managed to get past the Jindo bug was to have everyone stack right next to the turret so we can spam it easily. Interestingly, what happened was the fight actually went perfectly normally and we shot the ship down, after which we just had to watch out for the Flame Sweep. Maybe the bug has something to do with his leap from person to person? I’m not sure. Also, on the earlier attempt, the ship bugged and spamming the turret seemed to reset it. Maybe just the visuals are bugged? I don’t know. Just saying on what I’ve encountered. And can we, for the love of god, get some updated guides? Every FP has had changes since these guides were posted. So im lvl 65, but every time i go to do this in solo mode, it level locks me down to lvl 50, so when i get to the Prototype A-14 & Prototype B-16, they deal 20k HP but level lock puts me at 17k HP so its an instant kill… any suggestions on how to get rid of level lock?